Professor Doctor Richard Krautheimer and Doctor Trude Krautheimer-Hess, Christie's New York, 19 January 1996, lot 56. New York, Institute of Fine Arts, Drawings from the Collection of Mrs. Richard Krautheimer, 1961. Durham, North Carolina, Duke University, Italian Master Drawings from the Collection of Mrs. Richard Krautheimer, 1963, no. 14. 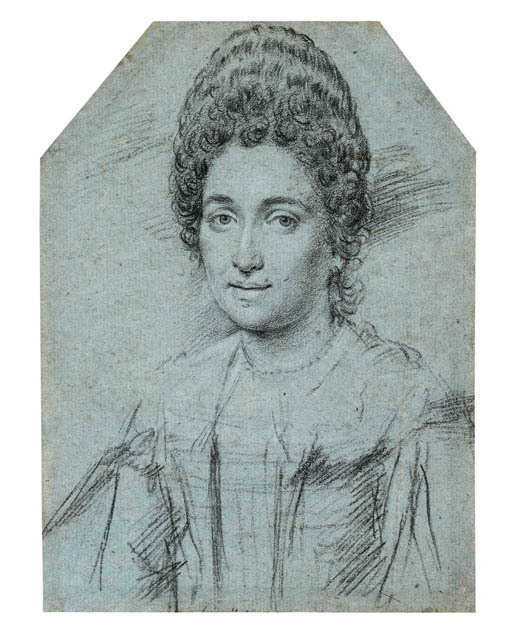 The sitter in the present portrait resembles that of Angela Calzettara exhibited by W.R. Jeudwine in 1966, no. 13, and now in the Stanford University Museum of Art,, J.T. Spike, Baroque Portraiture in Italy, exhib. cat., University of California at Stanford, 1984-5, app. fig. 31, and the Lady with a veil in the Albertina, V. Birke and J. Kertész, Die Italienischen Zeichnungen der Albertina, Vienna, 1994, II, no. 1736. According to Professor Krautheimer's notes, Jacob Bean confirmed the attribution to Leoni in 1988.